IDT Introduces Synchronous Ethernet Solution for 4G/5G Mobile Networks Using Marvell PHYs | Integrated Device Technology, Inc.
SAN JOSE, Calif., April 26, 2018 /PRNewswire/ -- Integrated Device Technology, Inc. (IDT) (NASDAQ: IDTI) introduced today a Synchronous Ethernet solution for 4G/5G mobile networks using Marvell's Alaska X family of devices. Synchronous Ethernet (SyncE) provides the ability for frequency distribution and synchronization over Ethernet-based packet networks. SyncE helps service providers meet the challenges of increasing bandwidth, coverage and mobile application layer services which require high-accuracy synchronization. In addition, SyncE improves the reliability of time synchronization of 4G/5G base stations working in conjunction with IEEE 1588. The joint solution has been pre-tested to pass all ITU-T G.8262 compliance testing including wander transfer, tolerance and generation. The solution, which features the Marvell® 88X3340P Alaska X 10Gigabit Ethernet PHY and IDT® 82P33831 synchronization management unit, allows end-customers to design products compliant to the ITU-T G.8262 specification if the proven recommendations are followed. The two companies have also released a white paper titled SyncE Wander Testing for Marvell 88X3340P and IDT 82P33731 that highlights challenges solved by the joint solution to achieve standards compliance and includes relevant testing data and design specifications, to aid customers. The simple, proven reference design solutions in the paper are presented using the IDT and Marvell devices. This white paper details the first of several planned pre-tested solutions to demonstrate system performance and provide technical guidance to simplify customers' design efforts. "Ensuring a system is compliant to ITU-T standards can be a major concern, but IDT and Marvell have taken that concern away," said Kris Rausch, vice president and general manager of IDT's Timing Products Division. "By using this proven solution with readily-available silicon from our two companies, customers can focus on other areas that bring value to their products without worrying about G.8262 compliance." 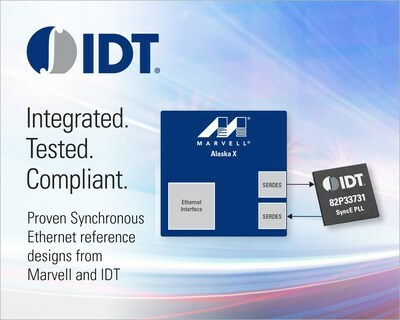 "IDT's synchronization management unit pairs up nicely with Marvell's industry-leading 10 Gigabit Ethernet PHYs," said Chris Koopmans, executive vice president, Networking & Connectivity at Marvell. "By taking advantage of our PHYs' SyncE support, the combined system allows customers to build high-performance Ethernet solutions that support the high-accuracy time synchronization required by today's demanding 4G/5G application layer services." Visit idt.com/marvell to download the white paper and get more details on the reference design solution. For more information about IDT's industry-leading portfolio of timing solutions, visit idt.com/timing or contact your local IDT sales representative.